Most Saturday mornings will find me in planning corner with my laptop and planner working on my menu for the upcoming week. As per me, I am always trying something different and I am currently loving my most recent menu planner that I posted recently (pictured to the left). My breakfasts rotate between a few favorites and there is no need to plan them but my lunches and dinners I do. 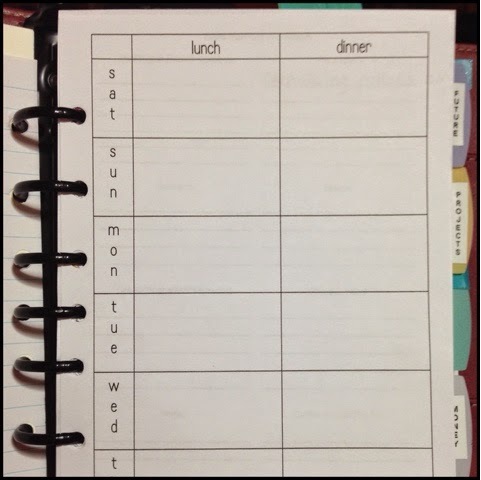 I save my menu plans and file them away for inspiration later in my "everything else planner" with an A-Z file. Tip: once you've saved several, you don't even have to "plan" a meal, just choose a menu! I follow a plant-based diet, more specifically Dr. McDougall's starch-based program, and find lots of ideas an inspiration from a Facebook group I created 2½ years ago called McDougall Friends (we're close to 5k members!). 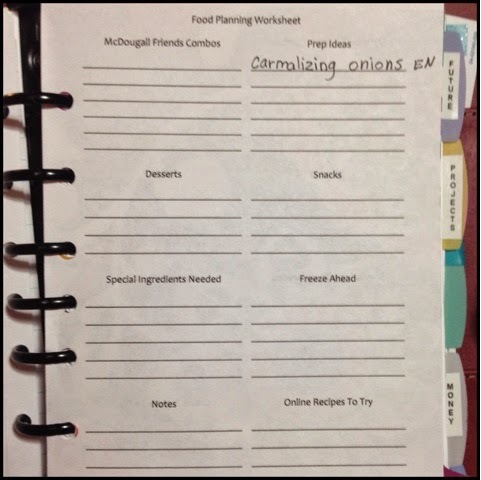 There is a steady-stream of great tips coming from the group that and I needed a way to compartmentalize those ideas so that I can use them - thus another printable - a Food Planning Worksheet! ~grin This printable is so specific to my needs that I doubt anyone else would be interested but if you are, you can leave a comment and I'll post it. During the week I'll pull out this worksheet when I see a tip for prepping foods, freezing ahead, a lunch combo someone from the group posted, etc. This helps keep my head from getting full of information overload while still getting to try the ideas I've learned - just a little something that works for me. Note: In the picture to the right I have "caramelizing (that I never seem to be able to spell correctly) onions EN". This tells me that I can find this idea for caramelizing onions in the crockpot on my Evernote account. I'm not fully convinced that I want to keep using Evernote because you only have a limited amount of uploads and I am too cheap to pay for a premium account. I'm still working that one out.